Launch Pad Discovery - Solar System Planets And Moons Section. Discovery reaches the launch pad. Space Shuttle Discovery atop of its crawler transporter. In preparation for its return to flight, the Space Shuttle Discovery made the long slow journey atop its Crawler Transporter out to the launch pad yesterday. A small crack was discovered in the fuel tank insulation, but engineers didn't feel it was enough of a risk to delay Discovery from moving out to the launch pad. If everything goes well, Discovery will lift off on May 15, but a final report from the Columbia Accident Investigation Board could demand additional changes that would push the launch back. NASA's Space Shuttle Discovery arrived at its launch pad completing the next major milestone for Return to Flight of America's Space Shuttle program. 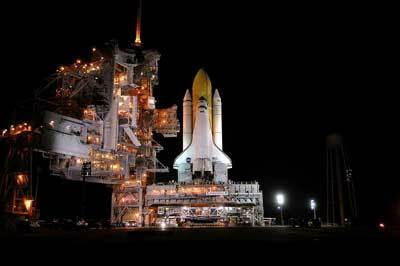 The Shuttle arrived at its launch pad at 12:30 a.m. This was approximately three hours later than its scheduled arrival. The slight delay was caused when Shuttle processing team members had to replace a Programmable Logic Controller (PLC) circuit card on the Crawler Transporter during the final leg of its journey. The Crawler Transporter is the vehicle which transports the Space Shuttle and its Mobile Launcher Platform to the launch pad. The PLC is an indicator that relays height measurements to the Crawler's operators while it's in motion. The issue occurred during Discovery's initial attempt to climb the incline ramp leading to Pad 39B. When observed, technicians decided to stop the rollout and then reverse Discovery back down the incline ramp to level ground to test and then replace the circuit card. Once the new card was in place, the Crawler functioned normally and the rollout was completed. The Space Shuttle remained level and in a safe configuration throughout all movements and during the changeout of the card.